Every day, 800 women die from preventable causes related to pregnancy and childbirth. 99% live in rural areas. Many of them could be prevented with proper maternal care including ultrasound imaging during their pregnancy and delivering in a medical clinic. Of those deaths, 40% are due to injuries or conditions related to placenta complications - and the only way to detect abnormal placenta challenges is through an ultrasound exam. 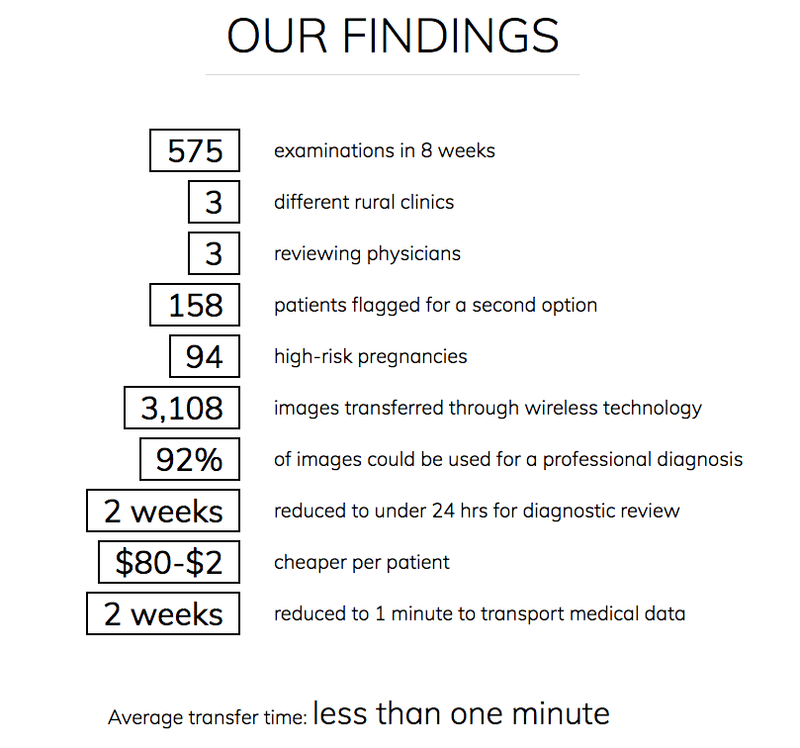 A few years ago, SonoSite partnered with Qualcomm Wireless Reach, Trice Imaging Inc., and Sony to create the Mobile Ultrasound Patrol project, a trial project showing that local sonography with remote interpretation can reduce turnaround time to 24 hours, while decreasing cost from $80 to $2 per study. In rural areas of Morocco, pregnant women often have to wait up to two weeks to obtain the results of a critical obstetric ultrasound. Through the course of the Mobile Ultrasound Patrol project, medical professionals drove in a Mobile Ultrasound Patrol caravan to three small villages in rural Morocco (Oulmes, Boulmane, & Ribat el Kheir), using Fujifilm SonoSite portable ultrasound devices and Trice Imaging’s cloud-based image management solution. Local midwives, nurses and doctors performed 575 ultrasounds on expecting mothers and sent the results to be interpreted and diagnosed by physician specialists in 3 larger remote cities. By scanning with the SonoSite iViz and SonoSite M-Turbo, and tranferring data through Trice's online image collaboration platform, study participatns were able to receive a diagnostic review via the web within a very short timeframe – without needing to transfer the patient at all. The transportation of a patient's data was reduced from 2 weeks to 2 days to 1 minute - and the time for a diagnostic response was reduced from 2 weeks to 2 days to 24 hours. Ultrasound medicine is experiencing drastic changes. New technologies are disrupting how ultrasound imaging is executed by whom and at what cost, allowing for improved accessibility that can help pave the way for new, sustainable models of healthcare economics. With a faster transfer of ultrasound exam results, this collaborative global healthcare project helped rural health houses in Morocco to detect at-risk pregnancies more quickly. Here's a quick view of final findings. The Mobile Ultrasound Patrol Project was driven by the opportunity to provide medical care to people who have limited access to medical support and new technologies. Read the full story on the Mobile Ultrasound Project site.